We are a well-known organization, which is engaged in offering Permanent Magnetic Coupling. These couplings are widely demanded in process technology for the protection of environment. The offered couplings are manufactured using superior quality raw material and advanced machines as per the requirements of our clients. Clients can avail these couplings in different specifications to meet their diverse requirements. We are engaged in offering Permanent Magnetic Coupling for environmental protection. These couplings are based on magnetic technology and are manufactured using superior quality raw material. To ensure the protection of environment, leakage-proof torque transmission is widely demanded in process technology. For pumps and agitators, highly toxic and aggressive media are required hermetically sealed drives. These couplings help in transmitting high torques in a careful and wear-free manner with the help of vessel walls. 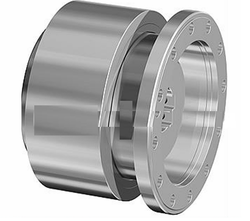 The advantages of these couplings are minimal wear as compared to dynamic seals. Our offered couplings are used in chemical and plastics industries. Looking for Permanent Magnetic Coupling ?